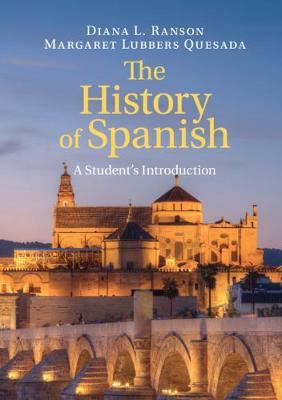 An engaging and thorough overview of the history of Spanish and its development from Latin. Presupposing no prior knowledge of Latin or linguistics, students are provided with the background necessary to understand the history of Spanish. Short, easy-to-digest chapters feature numerous practice exercises and activities. Diana L. Ranson is Professor of French and Spanish at the University of Georgia. Her publications include Change and Compensation: Parallel Weakening of /s/ in Italian, French and Spanish (1989) and articles on Spanish historical linguistics, syntactic variation in Modern Spanish, and phonological variation in Modern French. She has taught the History of Spanish, the History of French, Comparative Romance Linguistics, and Old Spanish for over thirty years. Margaret Lubbers Quesada is Professor of Spanish at the University of Georgia. Her recent publications include The L2 Acquisition of Spanish Subjects Multiple Perspectives (2015), and articles in journals, such as the International Review of Applied Linguistics, Journal of Pragmatics and Language Learning, The Handbook of Spanish Second Language Acquisition, and Estudios de Linguistica Aplicada. She teaches courses in theoretical, applied, and historical linguistics.